Homepage. This page: Two rare magazines issued by The Dominion Motor Spirit Company Limited. 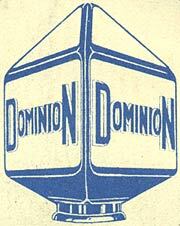 Dominion News - "A magazine for the Owner Driver!" Interest in petroliana, a collective term for collectables relating to petrol companies (for instance old petrol pumps, enamel signs, two gallon cans and the like) has existed for quite some time. Some people restrict their collecting habits to a particular type of item, illuminated pump globes being a popular if expensive choice, whereas some collectors focus on one particular company, maybe Shell Mex, or one of the almost-forgotten brands of pump fuel, such as R.O.P. (Russian Oil Products), Pratt's Petroleum, or Redline for instance. Collectors overseas, for example in America, have their own extensive choice of gasoline brands to choose from. One brand familiar to British motorists in the dim and distant past was Dominion Motor Spirit, popular in the 1930s, whose main offices were at 34 Bishopsgate in London. The two company magazines featured on this page were both issued by Dominion, one in 1935, and the other in 1938. It was a monthly publication, and contained a mixture of articles of interest to the 'owner driver' in the 30s. Many publications from the 30s refer to the 'owner driver', as it was still common for the well-healed motor-car owners of the day to delegate the actual driving of their horseless carriage to their tame chauffeur. So these magazines were aimed at the chap who owned and drove his own car, the type of chap often to be found lying underneath said vehicle at the weekend, spanner clutched in one hand, owner's manual in the other, while studiously observing the underside of his car, chewing thoughtfully on his trusty pipe. 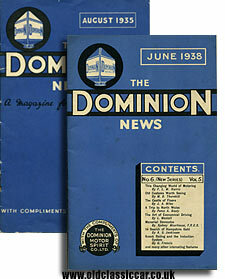 The older copy of Dominion News is dated August 1935, and featured within its covers the two fine glass petrol pump globes shown at the foot of this page. 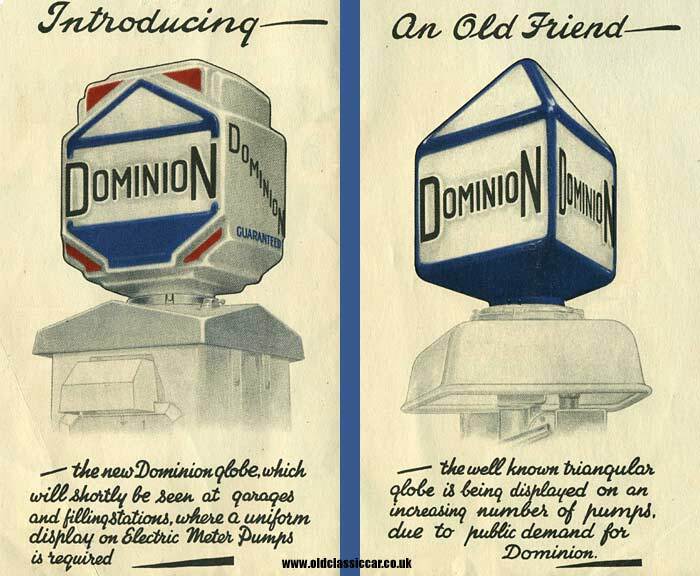 One introduces a new, more colourful, Dominion globe ".. which will shortly be seen at garages and filling stations, where a uniform display on Electric Meter Pumps is required". The second globe, a simpler design, is the ".. well known triangular globe .. being displayed on an increasing number of pumps, due to public demand for Dominion". 1935 - The demise of the four speed gearbox? "New ranges of popular cars which have been announced during the last few months nearly all have three speed gearboxes. The four speed box which a year or two ago promised to become universal is clearly losing its popularity. What is the explanation? I have been chatting with a number of car manufacturers, who tell me that in their view the public nowadays prefers to sacrifice a certain amount of speed on the highest of the indirect ratios rather than to experience the need for more frequent changing. In other words it is felt that a second gear on which one can reach 35mph, and on which steep hills can be climbed, is better than a second and a third which together provide only one advantage, namely, that there is better speed margin available for overtaking. Another reason, of course, why four speed boxes are tending to go out of favour is because the high speed engines of the present day have not the same capacity for pulling on a high third gear as their forerunners of two or three years ago. Motorists habits are changing too. When we drop down from top most of us expect to get into a gear that will get us almost anywhere except up the steepest hills in the country. Perhaps another reason why the days of what we used to term the "silent third" appear to be numbered, is because up-to-date synchro-mesh mechanisms make it easy for everyone to change down from a ratio of 5 to 1 to one of the order of 9 to 1 without any risk of damage to the pinions or to the nerves of passengers in the car". The later issue of this magazine follows a similar format, with articles on topics such as "The Art of Economical Driving" and a discussion about "Knock Rating and the Induction System" to captivate the reader. More amusing though is a tale called "The Red Light - a chapter of accidents" by F.R. Dempster, which I'll now recount below. Anyone who has ever run an older car, or battles to keep a vintage or classic steed on the road today, will recognise much of what is to follow!!! There are times when everything seems to go wrong. Such was the day when I invited Aunt Emily to accompany us on a winter drive. Aunt Emily took upon herself to invite Aunt Rose, the pet aversion of Eva, my wife, who flatly refused to go in the car, and signified her intention of staying at home - misfortune number 1. To fill the gap I persuaded - not without misgiving - cousin Reg to take the vacant place. As a keen amateur mechanic, Reg is something of an authority on cars and given to scathing commentary on all and sundry makes. I have always had a suspicion that he regards Gladys (that is my car) as just so much old iron and something that should not be allowed upon the road. It was a raw, biting day, and the ladies arrived beshawled and befurred. While they vied with one another in warm and affectionate greetings Reg and I betook ourselves to the garage to start up the car. I approached Gladys with a sinking heart. She is one of those pedigree old-timers which I have always considered immeasurably superior to the mass production job of to-day, save in the trifling points of appearance and showing signs of life on a cold and frosty morning. Knowing well the sulky and intractable nature of the car, I swung the handle more as a matter of form than with any real hope, and after watching my unavailing efforts, Cousing Reg took over, evoking the usual wheeze and sucking noise, but nothing else. "Not much compression there" he remarked critically, winding away. "Jump in and try the starter". I jabbed away, occasioning a dying whirr and clang. Reg fiddled with the carburettor and I played away with the throttle and ignition; encouraged by signs of firing that never materialised. After prolonged and fruitless pressing on the starter button, Gladys refused to give any sign of life other than a sudden funny little jump, succeeded by the ominous silence that marked one of her usual trances. "Give over" said Reg, "Your battery's done". "You'll have to give her a push" he said. "I'll get in and steer and we'll try what a run down the road will do". I shoved the car out of the garage, contriving to let the rear wheel run over my toe - my bad toe, of course - then Gladys came to an obstinate standstill while I strove and slithered on the frosty road behind. "Half a mo'!" sung out Reg, "I'm in reverse. OK I'm in neutral now, shove away!" I shoved and the car ambled down the road. The performance was watched with interest by my wife and the aunts. "Better send for a mechanic from the garage" suggested Eva, coming to the door. I shrank from such humiliation, and looked to Reg to help me out of the difficulty. "Can't you get someone to give you a tow?" he asked. "Oh! here we are!" and hailing the driver of a passing car, he made his request. It would be Johnson that he asked, Johnson, who owns a brand new super-six, and would wish nothing better than to tow my antediluvian Gladys before the wondering eyes of Acacia Grove. Before I could demur, Reg had improvised a tow rope from Eva's clothes line, and, seated at the wheel, I figured in the ridiculous procession that moved up the Grove. "Lord Mayor's Show" bawled Reg, in his coarsest manner, as we rounded the corner. Whatever show it was, it roused Gladys from her lethargyand in a few minutes she was ticking over strongly, if not quietly. At this juncture the tow rope opportunely parted and, leaving Johnson careering away, I returned in triumph to Acacia Grove. "Don't switch off!" said Reg, "or you'll want another tow. Now, good people, in you get!" With the usual bumping and stumbling, Aunt Emily and Aunt Rose settled themselves in the back seat, and off we went. "I like the way your car goes" said Aunt Emily approvingly, as we drummed along an arterial road. "So steady and with that nice little tick-a-tick you hear all the time". I reddened at the sarcastic smile on Reg's face. Piston-slap is one of Gladys' numerous maladies. "We're doing twenty" grinned my tormentor, turning round to the old ladies. "Are we?" replied Aunt Rose brightly. "Twenty miles already" she explained to Aunt Emily, who evinced no surprise at such record-breaking progress. We commenced a rise and ague and asthma assailed the labouring Gladys, who shook and wheezed in the throes of top-gear strain. "Change down!" commanded Reg, "You'll never get up"
"I used to do this nip in top" I explained, "You'll need first the way she's pulling" he replied, "Get down, man!" Gladys whined her way up in second, big tear drops rolling down her battered face. The way led down a valley, where a thick mist wrapped the car in its dense blanket. We crawled with sidelights on, an unwelcome strain on a battery that was almost flat. I heaved a sigh of relief as we emerged, and took a road that skirted a wide stretch of woodland. The naked architecture of trees has a peculiar fascination for me, and pulling in by a clearing, I suggested a walk. Cousin Reg got out to accompany me, and leaving the old ladies securely tucked up in the closed car we set off. We tramped the forest until we were tired and the fascination of the trees had lost its wonder. Confidently, we struck out for the car, and after an hour's solid walking, Reg stopped accusingly before a laden holly bush. "There are those same darn berries" he growled, "Don't you remember remarking how they contrasted with the birch trunk that stands behind them?" I did, I had pointed out that bush just before we set out for the car, and we were back to it. Another hour's floundering put us right, and with circulation and tempers well warmed, we reached the clearing. Aunt Emily and Aunt Rose were deep in conversation, they gazed on us with the superior geniality of people at ease who look upon others hot and bothered. Gladys was stone cold. Preparatory to swinging the starting handle, I turned the ignition key. There was no answering red gleam from the dash. "Bulb gone!" I muttered, but I had a sinking feeling that it wasn't. Aunt Emily sat up and took notice. "Oh, I see you're turning that funny little key" she observed amiably. "Just after you'd gone I did that and a dinky little red light glowed in that hole. We were both saying how cheery and comforting it was, as we sat here waiting for you. It was shining away till a short time ago. We'd forgotten it in the interest of our talk, and when I looked again it had gone out." Return to the car collectables section, to read about more unusual motoring-related items.